On Sunday night, Southeast Series rookie Gary Helton proved that Nashville’s Music City Motorplex might now just be one of his favorite racetracks in the entire country. 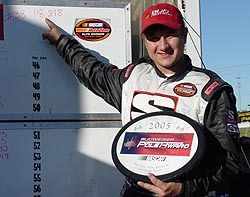 For the second time in his Southeast Series career, and his second time this season, Helton dominated the NASCAR Southeast Series event at the famed Nashville Fairgrounds track, leading the final 98 laps of competition and holding off a late-race charge from Tim Sauter to pick up the victory. But while the race victory went to Helton, his sweep of the 2005 races at Nashville was just one of the many story lines that came out of the 150-lap event. And it is a race that will be talked about for some time. And JR Norris, Jeff Fultz, Jeff Hamner, Jason Hogan, Charlie Bradberry and Allen Karnes are some of the names that will be uttered a lot in addition to Helton and Sauter when Southeast Series fans look back in their mirrors. the Fairgrounds track, collecting three-straight poles at the track, despite not yet earning a win. Fultz has struggled the past couple years at the track. “I figured this would be the race that gave us a big lead, drew us even more even, or gave JR a big lead in the points,” said Fultz. It was just that and it all took shape just 10 laps into the race. Norris started fifth on the night following the redraw after young Josh Hamner broke Norris’ streak of poles. Hamner, in just his second Southeast Series start (and his first behind the wheel of his family owned car), shocked many by grabbing the pole, then pulling a 10 for the inversion. By lap five, Norris was in third place, chasing down Dusty Williams and Justin Wakefield after making his way past Fultz. But on lap 10, Norris’ #5 went spinning all by itself into the turn two wall. Norris got the car refired, but limped it back to the pits and eventually to the garage area. He fell out of the event, finishing 21st, thanks to a cut right rear tire. That set the tone of the night for both Fultz and Hogan, each of which knew they would be able to take advantage of the situation. Behind Helton, Hogan was moving his way up through the field, as was former ASA National Champion Tim Sauter, who was driving a team car to JR Norris for Richie Wauters. Sauter had qualified second and started ninth and found himself in second just over 100-laps into the event. With 20 laps to go, Sauter made the first of his several attempts to grab the lead from Helton. As the two raced side-by-side amidst several lapped cars, Sauter found himself side-by-side with Helton. However, his #52 slipped on the outside groove and the veteran chased the car up the track. Sauter had to take some time to regroup and try again, which he did. But he was never able to grab the top spot. “There was a lapped car there,” said Sauter, making his first Southeast Series start in two years. “I went to the outside, thinking that was the only way I was going to get him. I just got up into the marbles though and it just took me up the track and I had to wait to get another shot at him. Helton knew Sauter was there. Josh Hamner made headlines by taking the pole in just his second series start. the front of the field. He patiently took third after Norris' accident. Then he passed Wakefield for second. Then he passed Williams for the lead. “We have a good car here. We have a new motor and the handling of the car is good. All put together, that makes for a pretty good piece to drive,” said Helton. “We ran the same shocks, springs and everything as earlier in the year (when he won at the same track). We freed it up a little bit from that first race of the year and maybe we did it a little too much. I guess the perfect setup is between what we did and where we were. 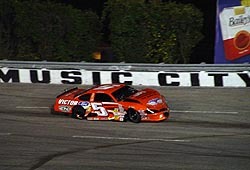 JR Norris' night ended early at the Music City Motorplex, costing him a shoot at the title. Then, Charlie Bradberry spun his #78 down the front stretch and slammed into the inside wall. That set up a late caution and an eventual green-white-checkered finish. However, the Bradberry saga wasn’t over just yet. As he righted his car, he drove around the backstretch and spun Karnes under caution, an apparent statement for the cause of his accident. Bradberry, who was on the lead lap and in eighth at the time, then parked his car as a result of the damage. Karnes was already a lap down at the time of the accident. side-by-side the final two laps, trading paint the while time. At the checkers, Hogan just nipped Sauter, grabbing second and a couple more crucial points in the championship chase. Wauters, Sauter’s car owner, had a few choice words for Hogan after the event on the front stretch, but eventually, cooler heads prevailed. As the rest of the post race fireworks erupted, so did Helton’s car in a awray of smoke. But it wasn’t engine problems. It was victory burnouts. 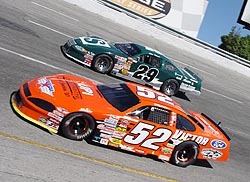 Tim Sauter (#52) and Allen Karnes (#29) each had a major role in Sunday night's race. 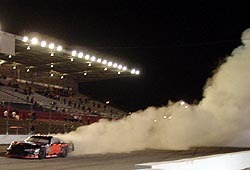 In fact, Helton’s burnouts were so good, and he was so pumped about the win, he had to drive an extra cool down lap to allow the smoke to clear from inside of the car so he could see where he had to drive to victory lane. “I didn’t not want to see that last caution, unless I’m in second and have a good car capable of winning. We had a good restart though and I think they might have spun their tires or something. Sometimes, it just works your way. Helton’s win and Hogan’s second-place run, along with Norris’ misfortunes, shuffled the point standings. Hogan moved up to second, with Helton bypassing Norris into third. Fultz, who finished an uneventful race in fifth, held the points lead. Gary Helton's burnout was fantastic.